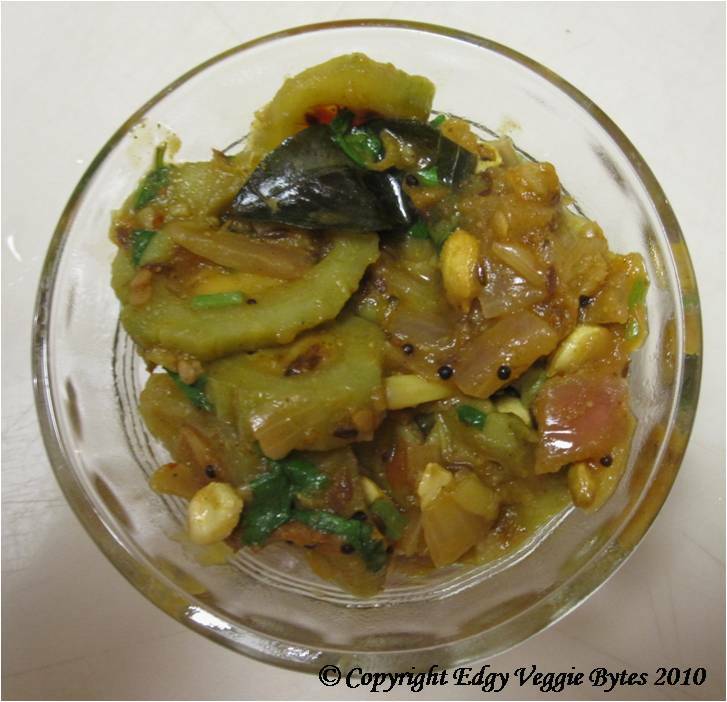 I’m going to preface this post by saying that karela (also known as bitter gourd or bitter melon) actually is bitter! It’s probably one of the most bitter veggies I’ve tasted. Most people I know don’t care for it too much, but I really like it. I once heard someone say soaking them in salted water before cooking makes it less bitter, so I tried it and it works! There are two main types of karela- one with smooth skin (Chinese variety, pictured on left) and one with spiky skin (Indian variety). A couple of notes: You may see recipes that call for sugar/jaggery- the only reason I don’t add this is because I don’t usually like sweet veggies. However, if you do, feel free to add a little to the recipe below. Also, some recipes ask for you to remove the seeds- I keep them in because I like the taste and the crunchiness. 1. Wash and peel the karela. Cut them into 1/4 inch slices. Soak these in water with 1 tsp salt for ~2 hours. Drain and squeeze the slices. Run them under tap water for a minute, then let them drain while you make the rest of the dish. 2. Fry the cumin and mustard seeds in the oil on med-high heat until the mustard seeds start to pop (~1-2 min). Add the curry leaves, onions, and garlic and saute for ~5 min. 2. Add the remaining spices and fry for another 1-2 min. 3. Add the tomatoes and cook on med heat until the liquid is gone (~15 min). 4. Add the ginger, karela, and 1 cup water. Cover and simmer till almost dry on low heat (~30 min), stirring occasionally so it doesn’t stick to the bottom of the pot. 5. Top with coriander and serve hot with rice or bread (naan, roti, etc.) of your choice! Thanks for the recipe! This is the best veggie for detox; great for those who are prone to breakouts.